Lily of the Valley with Star Anise and Magnolia. Veil your senses in ethereal tenderness. Lily of the Valley. Sweet Star Anise. A floral bouquet of Magnolia and Ylang-Ylang. Use a small amount in the bath or shower and rinse. Water (Aqua), Sodium Laureth Sulfate, Cocamidopropyl Betaine, Fragrance (Parfum), PEG-40 Hydrogenated Castor Oil, Sodium Chloride, Cananga Odorata Macrophylla (Ylang Ylang) Flower Extract, Citrus Reticulata (Mandarin) Leaf Oil, Illicium Verum (Anise) Fruit Extract, Illicium Verum (Anise) Fruit/Seed Oil, Lonicera Caprifolium (Honeysuckle) Flower Extract, Lonicera Japonica (Honeysuckle) Flower Extract, Michelia Alba Flower Extract, Glycerin, PPG-26-Buteth-26, Butyl Methoxydibenzoylmethane, Ethylhexyl Methoxycinnamate, Ethylhexyl Salicylate, Benzyl Alcohol, Geraniol, Hydroxycitronellal, Limonene, Linalool, Sodium Phytate, Tetrasodium Glutamate Diacetate, Propylene Glycol, Phenoxyethanol, Potassium Sorbate, Salicylic Acid, Sodium Benzoate, Sorbic Acid, Sodium Hydroxide, Blue 1 (Ci 42090), Yellow 6 (Ci 15985). 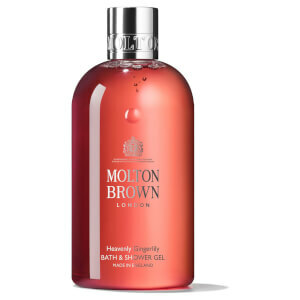 All Molton Brown products are above average. Dewy Lily of the Valley and Star Anise Bath & Shower Gels are divine and provide the extra pampered feel of the bath experience. The small touches are oftentimes the most important ones.